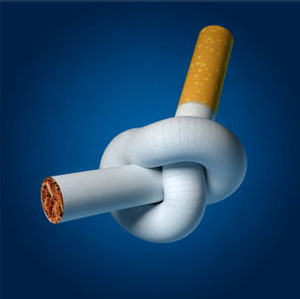 It was crucial for my disabled vet brother, a schizophrenic, to quit the cigarettes - not easy, since he'd smoked two to two and a half packs a day for thirty five years He'd lost his voice, and removal of numerous polyps, some pre-cancerous, made quitting absolutely essential, or death loomed. After a number of times quitting, all ending in failure, it was good hypnotherapy that worked. The thought that he was poisoning himself did the trick, with seeing the color green acting as a visual prompt to remind him constantly of the poisoning/death looming connection. He's now been totally off the cigs. for five months, and swears he will never again take a puff, cause it's poisoning himself. I know just got out of the hosp. and must give up the butts. Have understood every thing about the cig. and when I thought I had two years left on this earth, it was eat, drink,make marry, and smokem. But giving them up is one of the most difficult things I have ever tried. More adictive than heroin, over 110 "additives" added to the cigs. and the tobacco companies will not say what they are. Every poison known to man is in the smoke. So when you hear people talking about "pot" crystal users, and the war on drugs, just think of all those cig. smokers who should be in jail.